BOURNE, Mass. – A combination of pitching, the Falmouth Commodores' representatives, and the LSU contingent fueled the West All-Stars' 5-0 shutout victory over the East All-Stars at Doran Park on Sunday night. 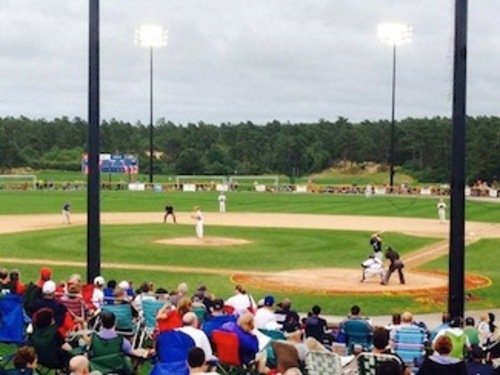 The Friendly’s Cape Cod Baseball League All-Star game was a display of dominant performances from the representatives from the five West Division teams, who held the best of the East to just seven hits, while scoring five runs on nine hits. The game belonged to the pitchers on both sides early in this contest. East starter Jordan Hillyer (Kennesaw St.) of Chatham sent down the first three West All-Stars in order in the bottom of the first and it was a sign of things to come. Hyannis’ Ryan Perez (Judson) was even more impressive for the West in the top of the third, as the “switch pitcher” struck out the side in order. It was a performance that earned him West All-Star MVP honors. After 2 1/2 innings, it was a scoreless tie with only four total hits vs. six strikeouts. The West got its offense going in the bottom half of the third. Falmouth’s Conner Hale (LSU) led off with a single and managed to make his way over to third before he was driven in by Tigers teammate and hometown hero Mark Laird (LSU) of Bourne to break the scoreless tie. Another LSU Tiger, Chris Chinea (LSU) of Wareham, then led off the bottom of the fourth with a deep solo home run to give the West a 2-0 edge. It was a tough day for Brewster pitching, as Andrew Naderer (Grand Canyon) and Cody Ponce (Cal Poly Pomona) were responsible for the two runs. The West was back at it facing against Orleans’ Kolton Mahoney (BYU) in the sixth inning. Two Commodores, Cameron O’Brien (WVU) and Jake Madsen (Ohio), reached base and came in on a deep RBI double from Falmouth teammate Matt Eureste (San Jacinto CC) to make it 4-0. O’Brien hit a solo shot to dead center to lead off the bottom half of the eighth that put it out of reach at 5-0. Ten pitchers combined for the shutout for the West. Both Perez and Falmouth ace Matt Hall (Missouri St.) also had multi-strikeout innings, and Bourne’s Travis Bergen (Kennesaw St.) retired the side in order in the seventh. East pitching wasn't too shabby either, as Hillyer, Orleans’ Nathan Bannister (Arizona), Harwich’s Jacob Evans (Oklahoma), and Y-D closer Phil Bickford (Cal St. Fullerton) all had strong showings. East All-Star MVP and league MVP candidate Aaron Murray (Georgia Tech) also looked good, going 2-for-2 with a double. Hyannis field manager Chad Gassman, who was the manager of record for the winning West squad, was simply in awe of the whole event. “It’s just an awesome stage. It’s an awesome feeling to coach them all summer then put them up on this stage and see what they do," Gassman said. "It all comes together. It’s a celebration and a lot of fun." Go to http://www.youtube.com/channel/UCHrSx5-s2Au489PN_G1xFFA to see Gabrielle Lucivero's exclusive interviews with Cape Leaguers.